Don’t want to actually get dressed up for Halloween this year? Facebook Camera has you covered. 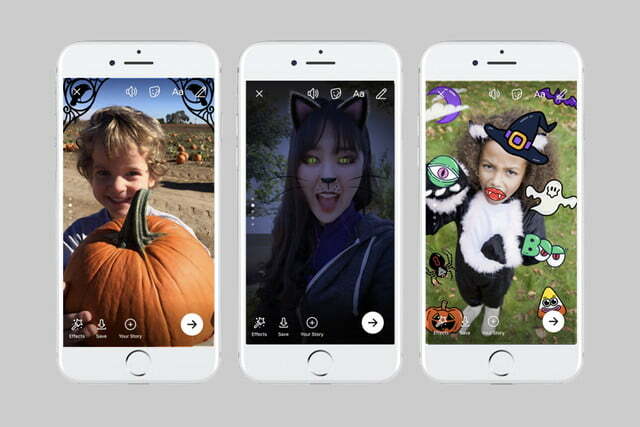 Today, October 23, Facebook shared several Halloween-themed features which will launch inside Facebook and Messenger later this week, including augmented reality costumes and Facebook Camera’s first video game. The masks and frames inside Facebook Camera will soon have more than a dozen Halloween-themed options. To direct users to the virtual “costumes,” Facebook will display a “Happy Halloween” message inside the news feed. Facebook Live is also getting a set of Halloween masks and effects that work while broadcasting live, including a vampire and Frankenstein’s bride. While the masks and features are just a holiday-themed extension of an existing feature, the season will also bring what appears to be, to our knowledge, the first game inside of Facebook Camera rather than the Messenger-based or Facebook-based options. The game puts users on a quest to escape a virtual haunted house by jumping their way out or hopping off walls. So why the Camera integration? The new game puts the user’s face on the character, and even allows changing expressions while scaling those virtual walls. 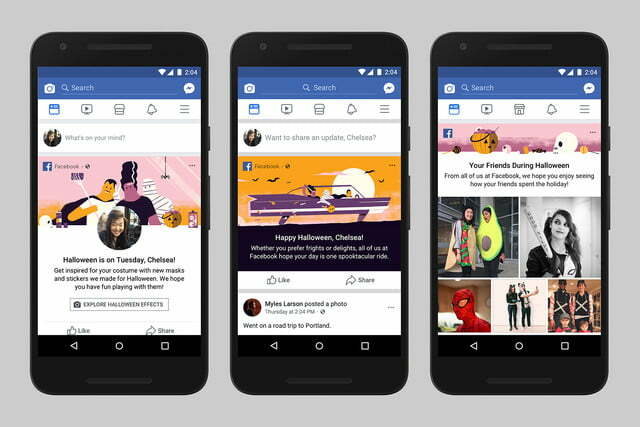 Facebook’s Halloween celebration continues with new themed backgrounds for status updates. Facebook will also suggest nearby trick-or-treating events, with over 500,000 events already planned. The company’s seasonal tricks venture into Messenger, too, with the same Camera effects accessible through the tap and swipe shortcuts from the Messenger home screen or within individual chats. The same effects will also be available for video chats, the company says, accessible by tapping the video icon to start a video chat, then choosing the star icon to chat as a green goblin or a black cat. Facebook said that last year, Halloween was one of the top holidays for sharing on the platform, a trend that prompted the spooky-themed updates this year. Users have already started sharing costumes — so Facebook took note of the most popular options. The company said that the costumes generating the most conversation were themed after super heroes (or villains) and iconic cartoon characters, including Mickey and Minnie Mouse, Harley Quinn, Captain America, Bat Girl and Darth Vader. Don’t fret if you don’t see the updates yet — Facebook says they’ll being rolling out later this week.